Casual aquarium hobbyists and fish enthusiasts usually refer to different types of fish by their common names. Occasionally these names match the official, scientific names of the fish (such as the Bettas or Tetras), but more often the common name bears little resemblance to the scientific name by which the fish is categorized in the scientific literature. If you want to learn more about a specific species of fish, it's crucial that you know its official Latin name. The following list presents a grouping of fish with common names starting with B.
Corydoras metae. Also sometimes called the Bandit Catfish, this Cory comes from Columbia and grows to about two inches. It is a peaceful, bottom-dwelling aquarium fish that needs to be kept in groups of at least three of its own kind; lone fish will become very shy and usually don't live very long. The name "bandit" comes from the dark banding that runs from gill to gill over the top of the head. Since it is from the family of catfish, the Banded Cory does not have scales, but rather an armored skin. Betta splendens. The Betta is often known by another common name, the Siamese Fighting Fish. This is one of the most popular of all aquarium fish, due to the bright color and long flowing fins of the males. It is a relatively short-lived fish (two or three years) that grows to about three inches in size. Do not keep two males in the same tank, as they will spar and may injure or kill one another. This fish is often kept in small glass bowls, but this is a somewhat inhumane practice. They will thrive in tanks two gallons or more in capacity and should be kept with other fish of roughly the same size or larger. Leporinus fasciatus. 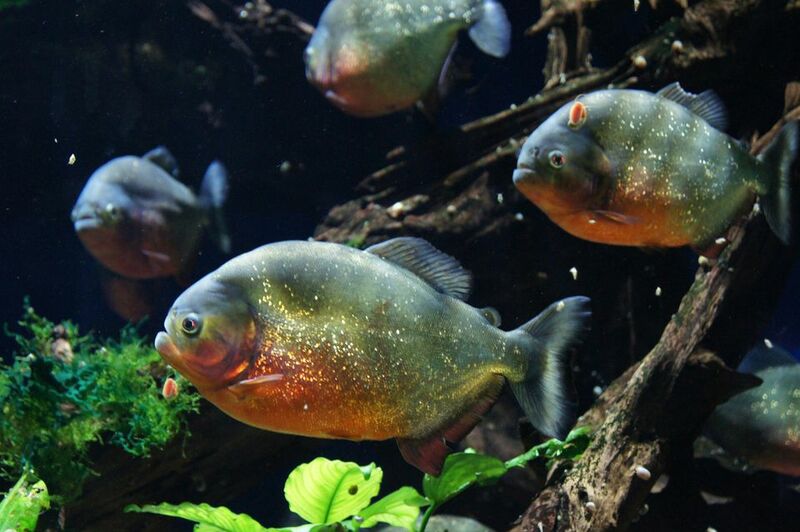 This is an aggressive fish that grows rather large for an aquarium fish (up to 12 inches). It requires a minimum tank size of 55 gallons. This yellow and black striped specimen is somewhat rare as an aquarium fish; it will be a conversation piece in your tank. The Leporinus is somewhat difficult to raise, and doing so is a sign of a skilled enthusiast. It has been known to jump out of its tank and will devour all living plants in an aquarium. Megalamphodus megalopterus. This species makes an interesting contrast to many of the other brightly-colored tetras with its silver color and black edging. They will readily school with other tetras and make a visually pleasing contrast with their more colorful cousins. The Black Phantom is a peaceful fish that will coexist happily with other fish. Although they may spar with other males, they rarely cause serious injury. Growing to only about 1.75 inches, this is a very easy fish to care for. For a small fish, it lives rather long -- up to five years. Ballon Platy - Xiphophorus sp.